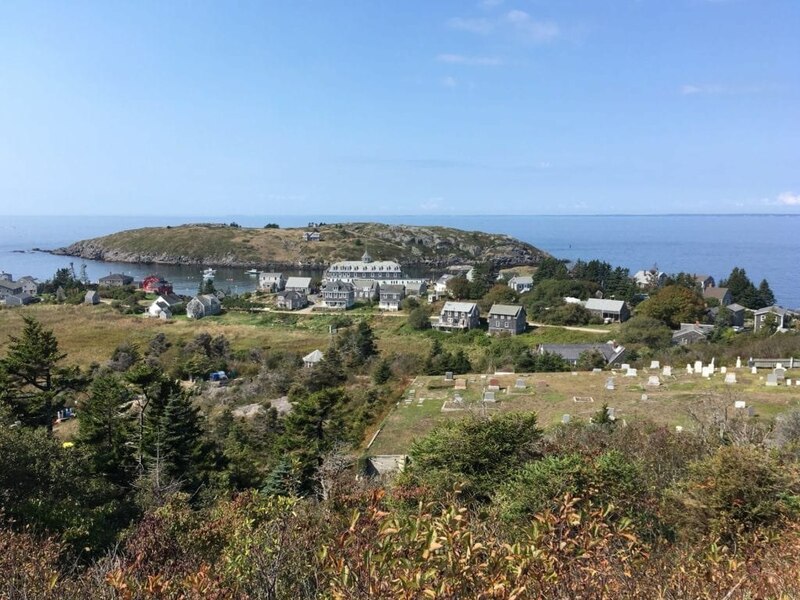 Monhegan Island is a small bump in the ocean (1.7 miles long and 0.7 miles wide), twelve miles off the mid-coast of Maine, that has played a larger role in history than most people would ever imagine. Monhegan was known to European explorers, even before the Weymouth Expedition in 1605, the arrival of Captain John Smith in 1614, and its use as a significant fishing outpost, with its protected harbor provided by the smaller and fortuitously situated Manana Island. In 1839, it officially became the Monhegan Plantation and limited settlement and development soon followed. 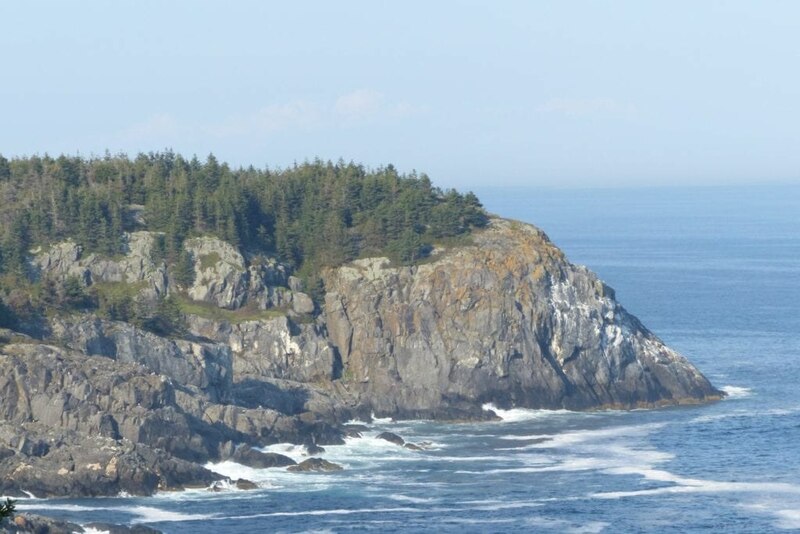 In the rush to take advantage of its natural beauty, including the highest cliffs on the Atlantic Seaboard at 160’, freshwater pond and nine-acre meadow, and extensive spruce/fir forest, Monhegan soon succumbed to human pressure and overuse, with much of its timber removed by the early 20th century. It was the foresight and personal appreciation of Thomas Edison’s son, Theodore, that led to the eventual purchase of 23 parcels and the formation of the Monhegan Associates in 1954 to protect the lands forever. 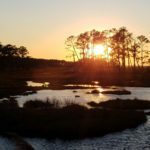 Today, two-thirds of the island is in a natural state, with miles of trails providing access. 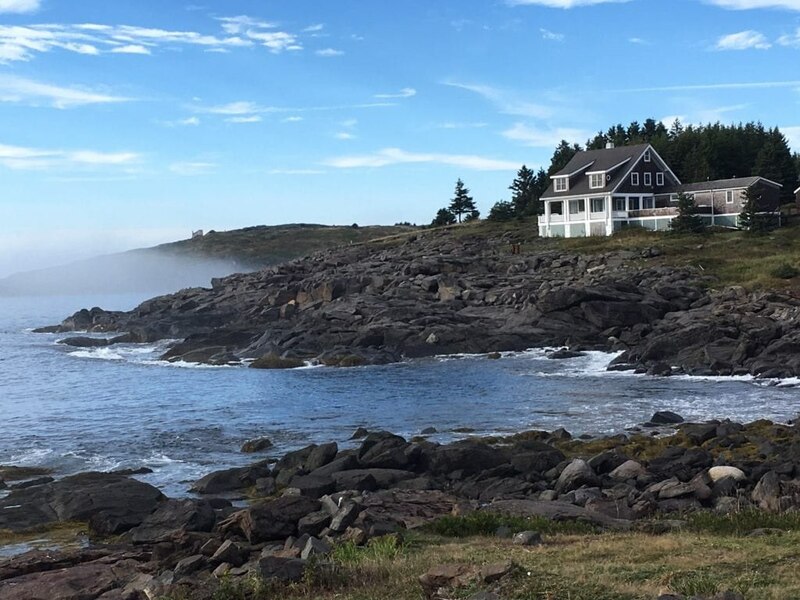 The combination of regrowth, plantings, and rugged coastline, along with the small artist-colony and lobstering town and the second highest positioned lighthouse in Maine, provide the charm and ambiance that continue to enchant and inspire visitors. 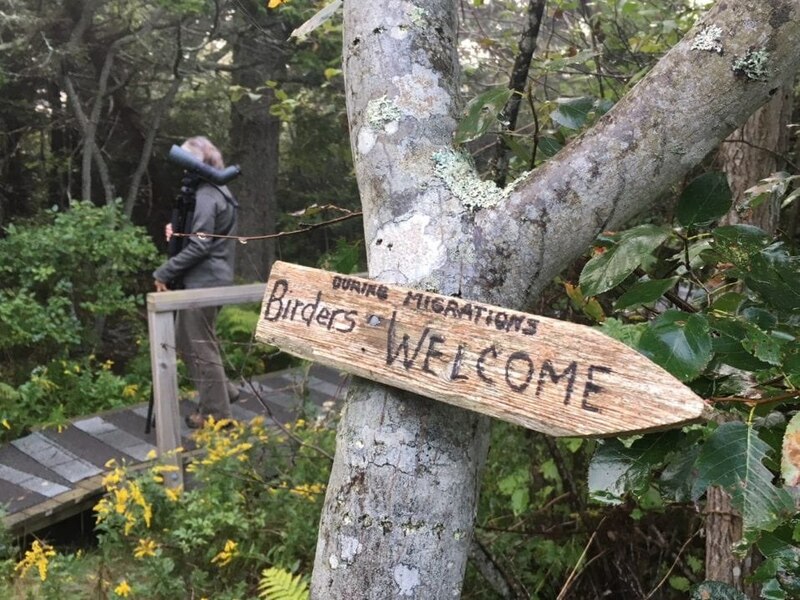 Of course, for us, it was the allure of Monhegan’s rich ornithological history, with records dating back over 100 years, extensive checklist, and continued enjoyment and postings by today’s birders that brought us to the island in the middle of September, to partake of fall migration at a true migrant trap. 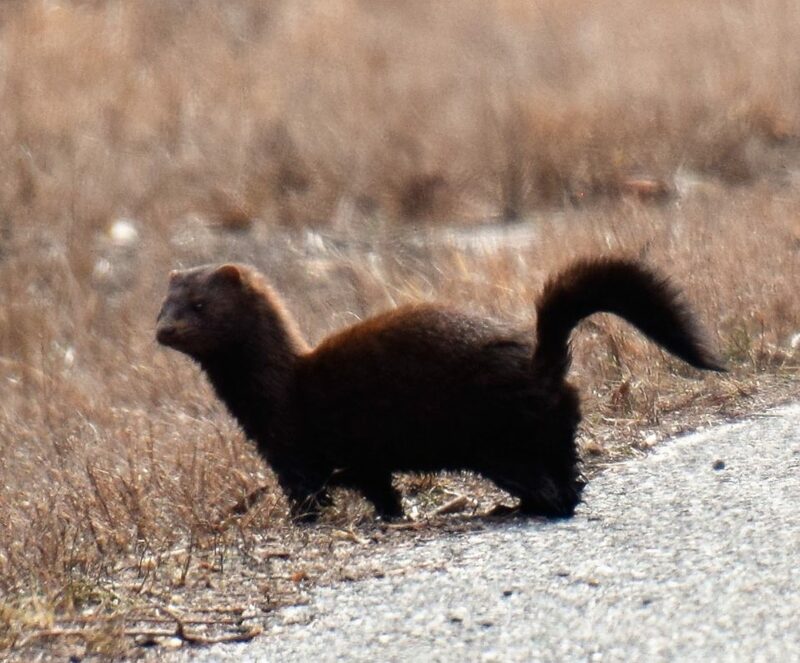 Along with the chance to view a diverse set of species, often at close range, Monhegan has a long list of rarities and vagrants recorded throughout the years. Leaving our vehicles on the mainland, we embarked on our tour from the Monhegan Boat Landing in Port Clyde, boarding the Laura B at 3 PM for the approximately one hour crossing to Monhegan, passing through several miles of near-shore islands before the open water expanse that led to Monhegan. 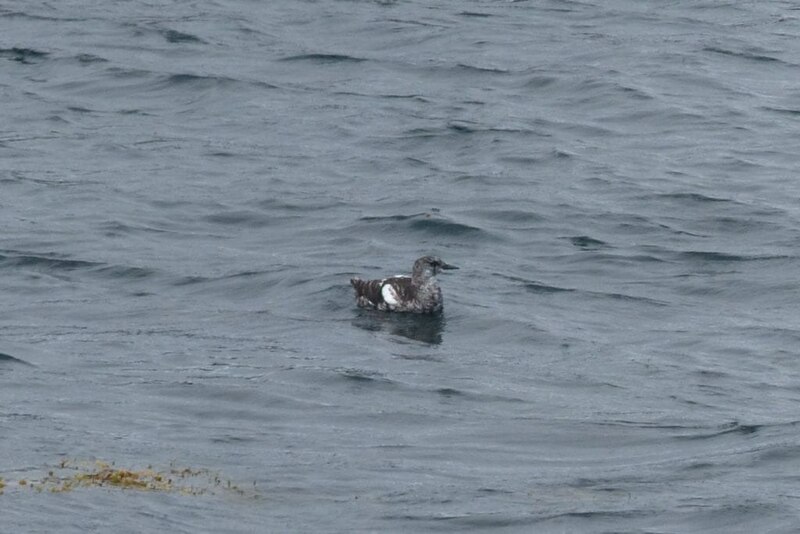 Common Loons and Black Guillemots greeted us as we left the harbor, and ever-present Herring Gulls, Double-crested Cormorants, and Common Eiders were constantly in view for the first portion of the trip. A Lesser Black-backed Gull resting on an island was the only one of the trip, as was a quickly passing Red-necked Grebe, both uncommon in this area. 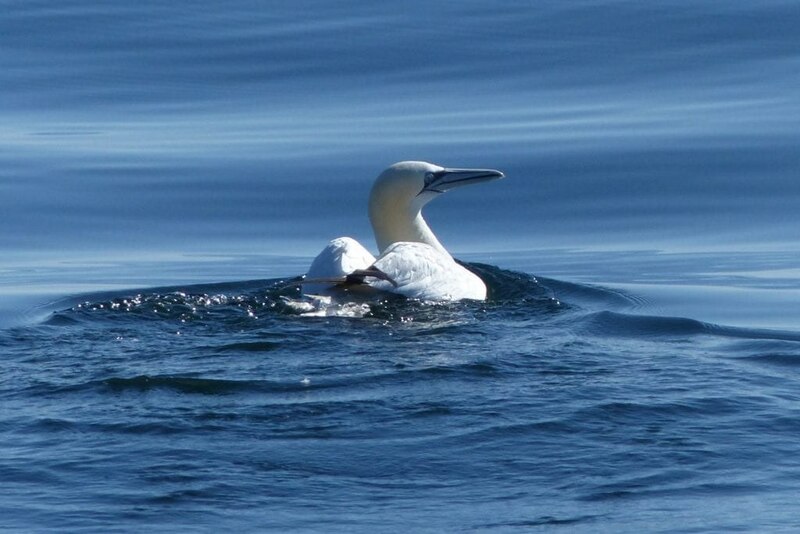 Several dozen Northern Gannets provided some entertainment on the comfortable ride over. After arriving at the small dock, centrally located on the west side of the island, we quickly checked into our nearby accommodations, and set off on our first trek – birding the main road and trail to Lobster Cove – the southern tip of the island. 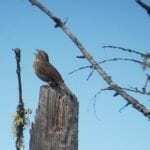 Despite the many wooded acres on Monhegan, mainly situated on the eastern and northern portions of the island, the best birding often occurs right along the town’s gravel roads and nearby trails, with clumps of lilacs and apple trees often a favorite location. We encountered our first moving group of migrants as we worked the southern end of the road, with birds appearing all around us – including numerous Red-breasted Nuthatches (the first of many encountered) Yellow Warblers, American Redstarts, Black-and-white Warbler, Northern Parula, Yellow-rumped Warbler, Black-throated Green Warbler, Baltimore Oriole, Blue-headed Vireo, Philadelphia Vireo, and many Black-capped Chickadees. We finished with some seawatching and the setting sun, before returning to the Island Inn for a relaxing dinner. The Wyeth House overlooking Lobster Cove. Our first full day on the island (day two) was encapsulated in fog, limiting our view, but not our enjoyment of the birds. The daily morning ritual began with a trip to the Ice Pond, a serene pond in the middle of the island that attracts wayward waterfowl, shorebirds, and wading birds, and warrants a stop to see what may have dropped in overnight. Bathing Herring Gulls, Purple Finches, Ring-necked Pheasants, and a singing Carolina Wren (the northern limits of their range) greeted us, but the warblers were quiet, except for a pair of Cape May Warblers along Alder Rd. After breakfast, we stretched our legs on the southern portion of the island, looping past the Wyeth house and Lobster Cove, and checking out the Harbor Rd. A Dark-eyed Junco worked its way along the road edge and an uncommon White-winged Scoter flew past. Purple Finches and Red-breasted Nuthatches were scattered throughout, and single Least Flycatcher and White-throated Sparrow spiced things up. 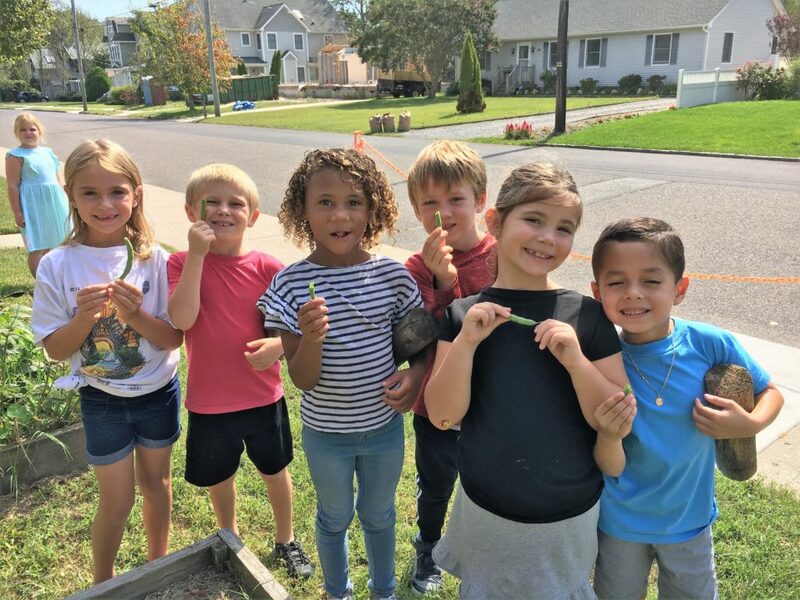 Our daily break for lunch provided an opportunity to experience the famed pizza at The Novelty, clam chowder at The Barnacle, or a selection from the small general store. The afternoon found us venturing further afield, travelling the Alder and Gull Cove Trails to Horn Hill and then out to Burnthead (one of three headlands on the cliffs fronting the eastern side of the island). We enjoyed the peace of crashing waves and unperturbed Common Eiders, before looping back along the denser Underhill Trail. A Merlin and Sharp-shinned Hawk emerged from the fog, while Yellow Warblers were quite prevalent, and Red-eyed Vireo, Magnolia Warbler, Common Yellowthroat, and Northern Waterthrush made an appearance. The view from Lighthouse Hill. The fog subsided on day three and the activity level picked up. The Ice Pond was quiet early, but produced a Least Sandpiper and Wilson’s Snipe on a subsequent visit late in the day, highlighted by the perfect golden light. A Dickcissel, another vagrant, actually landed in view on top of a tree along Alder Rd. in the morning (usually heard flying over). An uphill climb after breakfast put us by the lighthouse, with wonderful views of the island, surrounding waters, and mainland in the distance. 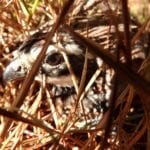 An exploration of the grassy field behind turned up our first vagrant, a beautiful Clay-colored Sparrow, along with another singing Carolina Wren. We broke up the day with an around-the-island boat trip aboard the Balmy Days after lunch, affording a different and more complete view of the island. Our first Great Cormorants (three) were located below Whitehead (a 160’ headland) and would be seen again later in the day. Gray and Harbor seals were present around and on the small rocky islands along Monhegan. Passing through the grassy field on our way to Whitehead afterward revealed an uncommon Olive-sided Flycatcher, appropriately fly-catching from the top of a snag. Raptors were also much more in evidence on this day, with our only Cooper’s Hawk making an appearance in the morning and the afternoon filled with a Northern Harrier, at least 6 Merlins (3 chasing each other), 2 Peregrine Falcons, and 3 Sharp-shinned Hawks. An Eastern Kingbird spent much of the day along the Meadow, often on the wire (and remained for the rest of our trip). Warblers were scattered throughout the day, with 10 species seen, including our first Chestnut-sided Warbler across from the Lupine Gallery and a Tennessee Warbler by the Library. At least 7 Baltimore Oriole made a bright presence, and the subtle beauty of 5 Red-eyed Vireos couldn’t be overlooked. Another highlight was finding a vagrant Lark Sparrow near the Ice Pond in the afternoon, following up on an earlier report. A small Green Snake was a vibrant surprise on the trail to Whitehead. We finished the day with a communal meal at the historic Trailing Yew, awash with candlelight and laughter. Fairy House in Cathedral Woods. Day four was repeating pattern of fog and clearing. A female Belted Kingfisher greeted us at the Ice Pond, just before a group of 4 Blackpoll Warblers dropped into the nearby spruce trees. We returned to the southern end of the island after breakfast and were rewarded with a Swamp Sparrow at the Meadow, a smattering of warbler species, including Cape May Warbler and Northern Waterthrush, Cedar Waxwings posing, and Northern Gannets cruising past Lobster Cove. A Great Blue Heron continued to entertain around the harbor and a Ruby-throated Hummingbird zipped by. After lunch, we headed north, following Blackhead Rd. until it was just a trail through beautiful spruce/fir stands. Red-breasted Nuthatches were plentiful, coming in small groups, and several Golden-crowned Kinglets serenaded us with their ‘seet-seet-seet’, but played hard-to-see in the tops of the trees. A Common Raven loudly croaked in the distance, a first for the trip. We took several different trails on our return, cutting across the Maple Trail to get into the oldest forest on the island in Cathedral Woods, appreciating the many and varied Fairy Houses that somehow decorate this section of the woods (fairy houses have a long, storied, and sometimes controversial history on Monhegan). 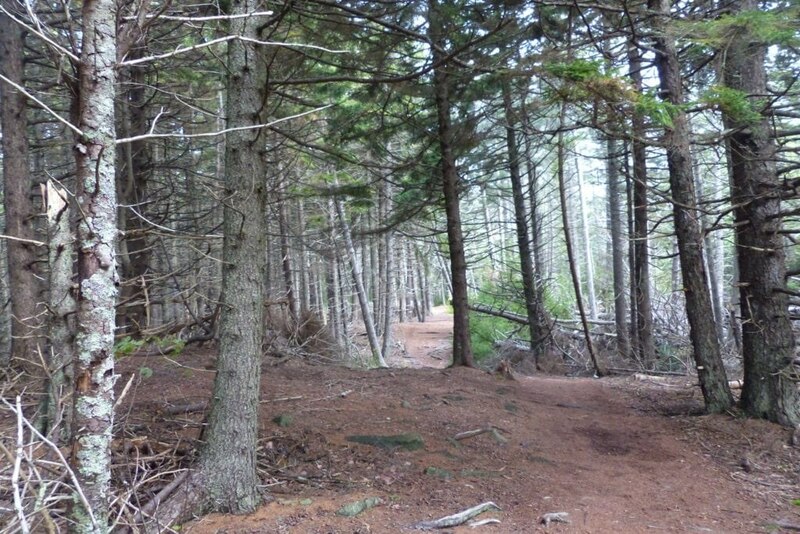 To illustrate the diversity of habitats even further, we followed the Red Ribbon Trail through dense, dark stands of small spruces, seeing even more of what Monhegan has to offer. Descending from the lighthouse revealed our second snake of the trip – a small Northern Ringneck Snake. With a front approaching, day five started rain free, but it seemed like the island was holding its breath for the rain to come. We encountered the usual suspects before breakfast, including the ‘bink’ of an overhead Bobolink and more Red-breasted Nuthatches, Blue Jays, and Black-capped Chickadees. By the end of breakfast, the rain had arrived, and we settled ourselves on the porch of the Island Inn to keep watch of the harbor and adjacent Manana Island (or try our hand at a collective puzzle). The Black Guillemots, Great Blue Heron (on a dingy), Double-crested Cormorants, and Common Eiders always put on a show, and 2 Laughing Gulls tried to hide among the many Herring and Great Black-backed Gulls present. A Great Cormorant lumbered by and a calling Greater Yellowlegs expanded our shorebird list. The system cleared by 2:00, and the birds responded nicely. Warblers were out around the Winter Works and Library, with Black-throated Blue new for our list and a second Philadelphia Vireo. A walk to Lobster Cove was productive, with an Eastern Wood-Pewee posing near the end of the road and a Spotted Sandpiper bobbing along the rocks in the cove. A pleasant surprise was the Bobolink that appeared out of the grasses at the cove and alighted briefly. A bit of added excitement involved watching a fishing boat right of the island haul in a reported 700 lb. Blue Fin Tuna. We finished the day off right with summary of our sightings and a fine meal at the Monhegan House. The passing of the front brought some anticipation for our last morning on the island. The switching of winds to NE, after 5 days of SW (a result of high pressure system blocking Hurricane Florence), was a good sign for increased activity. Our morning ritual was typical, not hopeful, but after breakfast it all changed. 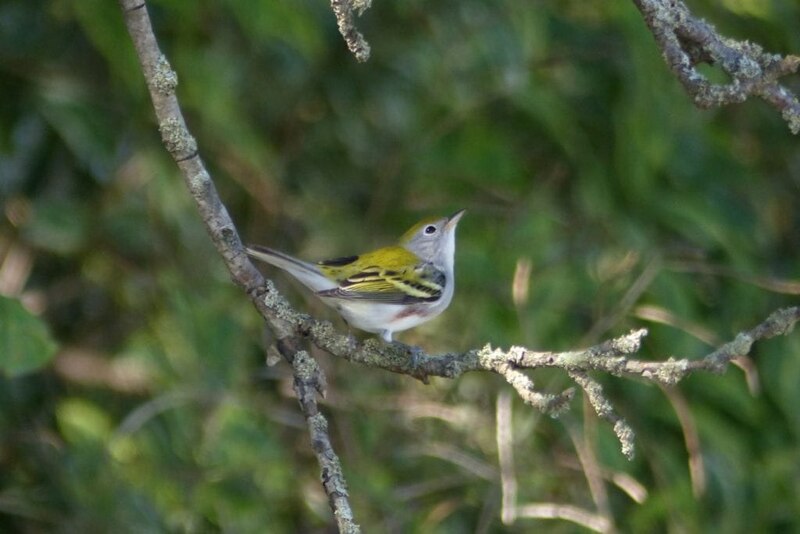 The area around the library was hopping, with multiple Red-eyed Vireos, another Philadelphia Vireo, and 8 species of warblers, including numerous Blackpoll, Yellow, and Cape May Warblers, and 2 Tennessee Warblers. 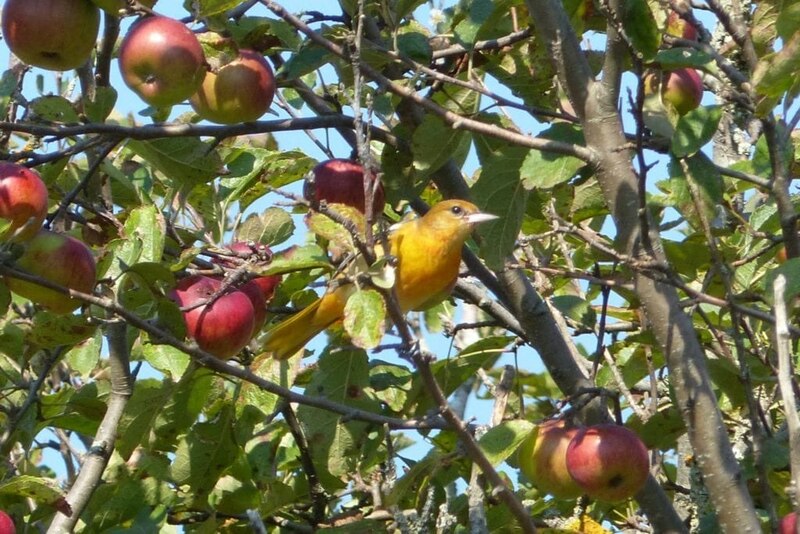 Along Alder Rd, an immature male Rose-breasted Grosbeak drew our attention, and a Dickcissel kept calling from a nearby tree – but never to be seen! Reports of a wave of warblers at the south end of the island drew us along, and we managed to find a few, but a Scarlet Tanager was the surprise there. Ospreys and Merlins were passing overhead as we walked, and an Eastern Pewee tried to sing its song. Reaching Lobster Cove for a final overview, we discovered a Semipalmated Plover on the beach, while 5 Least Sandpipers concealed themselves in the dried seaweed at the wrack line. Before we knew it, it was time to head back and prepare for our 12:30 departure. As we waited for the Elizabeth Ann to cast off, a very unexpected pair of Whimbrel called while flying over the harbor and a Common Raven settled on Manana – a wonderful sendoff from the island. Our return to Port Clyde was accompanied by Northern Gannets of various ages and plumages and a Bald Eagle on an inshore island. Common Loons, Common Eiders, and Black Guillemots once again escorted us near the harbor and 2 Sharp-shinned Hawks trying to out-soar a pair of adult Bald Eagles was fun to watch. 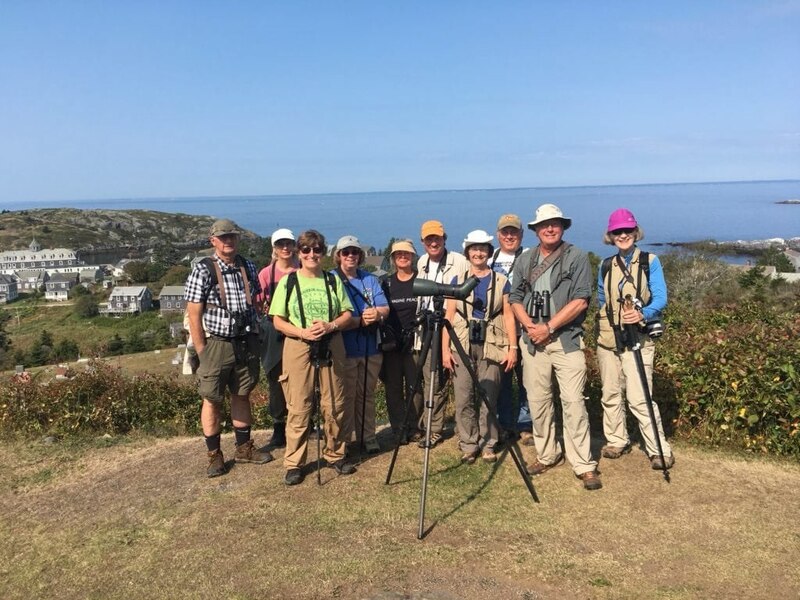 Our return to the mainland was capped off with a flock of 27 Rock Pigeons (not present on Monhegan), letting us know we had been someplace special. All in all, it was a wonderful trip, full of camaraderie, good food, beautiful vistas and natural settings, and birds. We managed 89 species for the trip, which included 7 raptor species, 5 shorebirds, 5 flycatchers, 3 vireos, 14 warblers, 7 sparrows, and more! !